Trained and influenced by some of the best legal minds, she has provided IP counsel to many well-known companies and amazingly talented entrepreneurs and individuals. 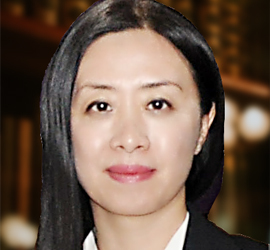 Jingjing Ye is a partner in the Dallas office of Culhane Meadows where she focuses her practice on patent prosecution and intellectual property. She completed degrees in both Electrical Engineering and Computer Science and was a rigorously trained electrical engineer and computer scientist before starting her legal career in New York City as a patent lawyer with several respected IP boutiques. Her practice is informed by and benefited from her comprehensive understanding of the technologies at issue. Ms. Ye learned the nuts and bolts of the patent practice in New York City where she successfully prepared and prosecuted hundreds of patent applications of a great variety of subject matter. She was then recruited to become in-house patent counsel at the R&D arm of Samsung Electronics in Dallas. At Samsung, Ms. Ye met and worked with many engineers and inventors at the forefront of the mobile communications industry and managed a portfolio of patent applications consisting of over a thousand cases. During the well-known patent war between Samsung and Apple, she handled the prosecution of a few highly significant cases that were finally selected by Samsung to allege against Apple. Her work was highly acclaimed at Samsung and was ranked number one among Samsung’s global R&D Centers in over 10 different countries. Ms. Ye provides her clients with comprehensive IP portfolio management in patent, trademark and copyright needs. Additionally, she offers experience in many patent-specific services such as prior art search, patentability review and assessment, patent drafting, office action responses, patent appeals, and patent reissue. She is also experienced in representing clients before the Patent Trademark and Appeal Board (PTAB) in proceedings such as Inter Partes review, post-grant review, covered business method challenges and supplemental examination. Ms. Ye is admitted to the State Bars of Texas and New York, and authorized to practice before the United States Patent and Trademark Office (USPTO). Holding a law degree (LL.B.) from the most prestigious Law School of China (Tsinghua Law School), she is also knowledgeable in Chinese law and can assist clients with U.S.-China transactions. She is a native speaker of Mandarin. Jingjing grew up in China with a very musical family. Her father was a piano professor and her mother an avid music lover. Trained in piano playing since the age of 5, Jingjing always found a great harmony between music and mathematics and did well in both, which led to her love of science and engineering. She adores animals and is a proud dog owner, a classical music aficionado and a fan of sci-fi. SUNY at Buffalo School of Law, J.D.